Are you ready for some Polygonal Lasso Tool creativity? We’ll start by making some confetti. 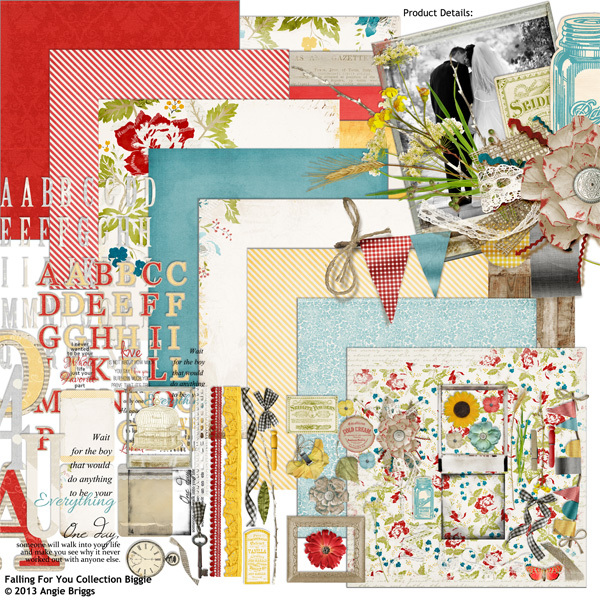 Open some colorful background paper from a digital scrapbooking kit or collection. I’m using papers from the fabulous Falling For You Collection Biggie by Angie Briggs. Choose the papers you want to use and open the first one, then drag all the others on top of the first paper, holding down the Shift key to center them in place. Get the Polygonal Lasso Tool and select an asymmetrical box or rectangle on the paper layer. Press Ctrl+J (Mac: Cmd+J) to place the paper bit on its own layer. Then go back to the paper layer and create another asymmetrical shape in another spot on the page, changing the shape just slightly for a nice, random look. But keep the shapes about the same size range. Press Ctrl+J (Mac: Cmd+J) to save it on its own layer, then delete the paper layer you just used. That will bring up the next paper layer. Do the same thing there, placing the confetti bits at different spots… two or three of each paper layer. Continue down through the paper layers, deleting the papers once you’ve cut out your bits, and at the end, you’ll be left with a nice scattering of confetti on a transparent background. And, since they’re all on separate layers, take a moment to arrange them any way you want. If you want to rotate some, delete some, or copy others, go for it. Once you’re satisfied with your array of confetti, go to the Menu Bar and choose Layer > Merge Visible. Then hold down the Shift key and click and drag from a corner handle to resize the confetti and make it smaller. Then use the Crop tool to crop around your confetti scattering. Save the image as a PNG file, named Confetti, and it’s ready to place on your digital layout. Don’t add a drop shadow to your confetti PNG until you place it on your digital layout… and when you do, make sure it’s a very shallow drop shadow at that. You want the confetti to look natural. What else can you create with the Polygonal Lasso Tool? How about cutting out strips of digital paper and notching one end to make ribbon? I made a bunch and layered them into a cluster for my page. Then splashed on my confetti… and ta daaa! So many creative possibilities… that’s why I love the Polygonal Lasso Tool. I’m pretty sure you will, too!